Last November, members of Wilfrid Laurier University’s Model United Nations club travelled to Kingston for the Queen’s Model United Nations Invitational to debate and discuss how to rein in climate change, how to deal with a deadly pandemic and how to wrest control of the White House in the early days of Donald Trump’s presidency, among other globally focused topics. The annual Queen’s competition, known as QMUNi, attracted university students from across Canada. Each student, or pair of students, was assigned a country on a United Nations committee and tasked with representing that country’s interests. The goal was for all members of the committee to reach a resolution but, in a room full of countries with competing priorities, that’s not always possible. Delegates were judged based on their ability to remain diplomatic and respectful, even during heated debates, and to work toward a common solution. One student from each committee was designated the best delegate. At QMUNi, Laurier’s 21-member team won “best large delegation” for the first time, an honour presented to the team with the most top-voted delegates. The win followed a second-place finish for Laurier at the 2017 QMUNi competition. Laurier's Model United Nations club was awarded Best Large Delegation at the Queen's Model United Nations Invitational. Members of the Model United Nations club were in Montreal Jan. 24 to 27 for McMUN, the McGill Model United Nations competition. 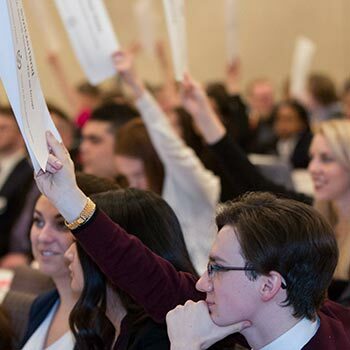 Laurier’s team, which was ranked one of the 25 best delegations in North America following the November competition at Queen’s, competed against some of the best teams in the world. Students only have about one week before the competition to research their country and topic, but the club’s internal conferences throughout the year provide members the opportunity to hone their public speaking, research and organizational skills. Members also learn how to speak persuasively, as well as consider and argue points of view they might disagree with. At the Queen’s competition, Dietrich was forced to take a controversial stance, representing a country that didn’t want to reduce pollution despite environmental destruction. Learning how to speak confidently and quickly under pressure is appealing to many political science and business administration students but, true to Laurier’s strong community culture, Laurier’s Model United Nations club has attracted students from varied fields of study, including the sciences. “As a Health Sciences student, a lot of people ask why I’m doing this,” said Melissa Rezk, a third-year student. “I’ve learned so much about how countries work, both nationally and globally. I have a better understanding of how health care issues play out on a global level, too.